Beginning in June of 2017, the Homer Village Board of Trustees will meet the second Wednesday of the month at 6:00 p.m. in the Town Hall located at 31 North Main St. in Homer. The Village Board of Trustees will occasionally schedule work session meetings that are open to the public. These work sessions will entail discussion of village business but no votes will be conducted. The Homer Village Planning Board meets the Second Monday of the month at 6:30 p.m. in the Homer Community Building, behind the Fire Station. 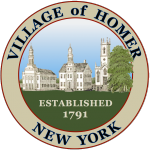 The Homer Village Zoning Board of Appeals meets the last Thursday of the month at 6:30 p.m. in the Town Hall, Board Room.